Like many dressage riders, one of my dreams has always been to don the shadbelly and top hat and ride at the FEI level. The books will tell you that the best way to learn to ride dressage is to ride a schoolmaster. Alas most people do not have the money to purchase a schoolmaster of their own or and do not have trainers with access to schoolmasters. 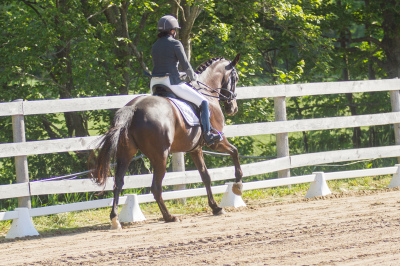 So for many dressage riders, achieving their FEI goals involves training an inexperienced or young horse, with or without the help of a trainer. Who Says Dressage Horses Can't Have Fun? Welcome to my new website! This is where I'll be reporting on happenings around the farm, show results, product reviews and my thoughts on what's happening in the equestrian world. Stay tuned!